Most enthusiasts prefer to be steeped in the history of Scotch Whisky as it is how we come to have so many great whisky expressions. We have sifted through many tomes to distil this history for easy imbibing. You can jump ahead with the links above or scroll down to learn it all! An easy yet comprehensive guide. I confess that I showed off the next time I saw my friends after reading this guide. Whisky History Guide Reviewed by Roger B. on May 15th . It is imperative to have a background on this noblest of quaffs, as it will be the foundation for which you, my fellow gents, may build your collections with confidence. Whilst you can always jump ahead to read up on Scotch today, let us start with alcohol at the very beginning to learn its modest origins. Beer, a subject also close to our hearts, is credited with being the oldest alcoholic beverage on Earth. It predates recorded history, with a mead-like fermented beverage of low alcoholic strength being the first recorded beer. Though distillation is also thought to have begun roughly around the 2nd millennium B.C., distillation for consumption is attributed to the Italians, ca. 12th century A.D. At this time distillates were primarily used as remedies for disease and, akin to fine ale, were distributed through monasteries. James IV sporting the Hawk, a must-have accessory. Scotch did not begin resembling what we know today until much later. It was not until 1494 that the first recorded existence of Scotch Whisky was entered into the annals of history. 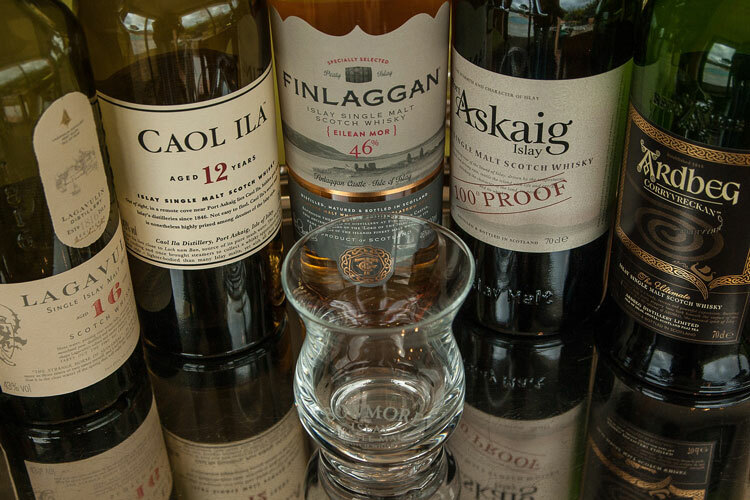 “Uisge beatha”, meaning “water of life” in the native Gaelic, is what whisky was originally called. Through generations of reinterpretation, slang, lazy tongue, and just the basic evolution of language, we derived at the word “whisky”. At this time whisky was still mostly a monastic pursuit. However, it became a favored beverage of James IV, Stewart Monarch of Scotland, and thus spread out among the lands as people emulated their beloved leader. In 1513, James was felled in a crushing defeat at the Battle of Flodden. Soon after, the English Monarchy took hold of Scotland and Henry VIII dissolved all Scottish monasteries, driving the monks from their homes. Many took their skills as distillers and worked in private estates, farms, or opened local shops where they created Scotch Whisky to earn a living. Thus began the Scotch Whisky boom–then an illegal substance by the standards of English rule. Whisky continued to gain popularity and, eventually, the Scottish Parliament decided to impose a tariff on spirits. However, Scotch Whisky still remained illegal under British rule. During the early 1700s the Royal Crown, wishing to receive a share of the profits but not willing to decriminalize spirit production, imposed a tax on malt at a rate of half the English tax–further straining the tensions between Scotland and its new rulers. By 1780 eight distilleries had been granted permits for production by the British Empire. The Crown also sought to crack down on illegal distilleries, thus ushering in an age of production which is the basis for modern Scotch. Forward to 1823: the Excise Act was passed at the behest of Scotland’s 5th Duke of Gordon. In fact, George Gordon himself was known to produce some of the best illicit whisky. Essentially this allowed distillers to obtain a license to operate. However, they would be subject to taxation from the British Crown. Some of the distilleries which obtained a permit from the Excise Act include Bowmore, Strathisla, Balblair, and Glenmorangie. These are still in operation today. In 1831 a new type of still, the column still, was developed which allowed for smoother finished products to be produced en masse while incurring lower costs. This first continuous still was developed by Scotsman Sir Anthony Perrier in 1822 and then improved by Robert Stein in 1828. However, the column still is often credited to Irishman, Aeneas Coffey, who patented his design in 1830 and developed it into what we may recognise today. The running of a column still was akin to multiple runnings of the standard stills, making a much more drinkable product and further catapulting Scotch Whisky into popularity. The Scotch Distillers Association, a failed attempt at a trade organization, governed the industry from 1865-1876. In 1877 “Distillers Company Limited” was founded through an alliance between six distilleries; Macfarlane, John Bald, John Haig, MacNab Bros, Robert Mowbray, and Stewart & Company. It focused on exporting Scotch outside of the United Kingdom. In 1880 Scotch consumption took off globally due to a wine, cognac, and brandy production shortage in France. This spiked its popularity as the global stock of Scotch’s main competition (and most popular drinks of the era) disappeared. Distillers Company merged with John Walker & Son and Buchanan-Dewar in 1925. It was purchased by Guinness in 1986 and rebranded as United Distillers. It is now majority owned by Diageo–the largest manufacturer of spirits, beer, and wine on Earth. While Scottish distillers worked on growing the brand and reaping profits, the Scotch Whisky Act 1988 was issued by the Parliament of the United Kingdom. This was intended to protect the historical significance and lineage of fine crafting which had become synonymous with Scotch; providing a legal definition of “Scotch”. This act primarily focused on production standards and so it was repealed and superseded by the Scotch Whisky Regulations 2009 (SWR). The SWR includes broader definitions and requirements for the crafting, bottling, labeling, branding, and selling of “Scotch Whisky”. Scotch as we currently know it is governed by the Scotch Whiskey Association (SWA). The SWA is charged with preserving the history and dignity of Scotch. It also works with international law enforcement to prevent the counterfeiting of Scotland’s biggest export. Another organization, the Keepers of the Quaich, was founded by the major companies in the Scotch world as a way to further the values, ideals, and image of Scotch Whisky. Being invited to join the ranks of the Keepers of the Quaich is the highest honor a distiller, collector, or enthusiast could receive. As of 2016, the SWA reports that Scotch Whisky accounted for 73% of all Scottish food & drink exports. This totals £4BN pounds sterling (USD$5.27B). Where does it all wind up? How Much Single Malt Scotch Whisky Is Exported From Scotland? Interestingly, only about 26% of the whisky exports from Scotland are single malt. Bulk spirits make up 5% of the market with the remaining 69% being blends. Bear in mind that this list doesn’t account for the rest of the UK where whisky is still considered a domestic product. Nevertheless, with the USA almost doubling the whisky imported by the country in second place (after all, France has plenty of wine and Champagne to choose from), we’re very proud to be American. Today only 20% of true Scotch is produced by companies based in Scotland. More than half of this by William Grant & Sons whose top brands include Balvenie and Glenfiddich. Over 40% of Scotch is manufactured by Diageo via more than two dozen brands, including Johnnie Walker, Oban, and Talisker. Pernod Ricard manufactures another 20% of Scotch with their biggest brands being Glenlivet, Chivas Regal, and Ballantine’s. Although Pernod Ricard is mostly known for its anise-flavoured Pastis from the south of France, it also owns both GH Mumm and Perrier-Jouët Champagne houses. The remaining market is made up of smaller firms such as BenRiach. Despite the majority parent companies no longer claiming Scottish heritage, the production standards, methods, and, in many circumstances, equipment, are still pure Scotch. Should you wish to learn more about Scotch production, we have outlined a variety of distilleries and their various offerings in our Distillers Profiles.